A quick guide to help you select the best tasting syrup for your taste buds. Every grade is unique! Learn about the grading system and how to identify the subtle differences that makes maple syrup so amazingly good! Light, golden color with a mild, delicate taste. Excellent as a table syrup or over ice cream or yogurt. A light amber color and full-bodied flavor, this class of syrup is the product of choice for consumers who desire the classic maple syrup flavor. A dark amber color with a more pronounced maple flavor, this class will satisfy those consumers who desire the strong flavors of what has been known as Grade B. Nearly black, this syrup has a strong flavor that translates well to cooking, where the maple flavor will carry through to the finished dish. 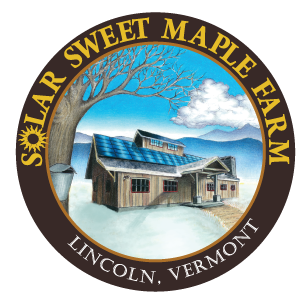 Solar Sweet Maple Farm, owned and operated by Tom and Rhonda Gadhue, is nestled in the mountains of South Lincoln, Vermont. We are situated on 200 acres of manged forested land and tap 23,000 beautiful maple trees. This operation is a dream come true for Tom who was bitten by the sugaring bug as a young child.